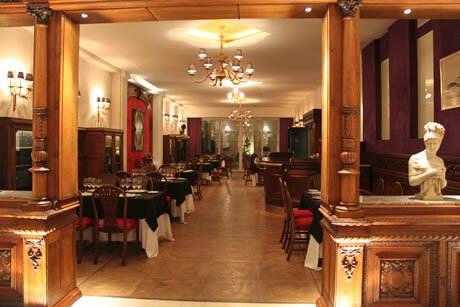 The Hotel Club Francés Restaurant offers a relaxed and friendly atmosphere in a classic building full of history. Its setting is based on the restoration of antique furniture and works of art. The table layout resembles a luxurious private dining room. The bar is absolutely elegant, revisted in mahogany feather 120 years old. Behind the bartender stands a replica of the “Napoleon in 1814 Campaign” by Meissonier. By its stools have passed all kinds of personalities from social, cultural, political and sports. Nowadays you can often see a mix of young people, diplomats and writers of different nationalities.